Adult Education offers English as a Second Language (ESL) for people who want to learn to speak, read and write English. 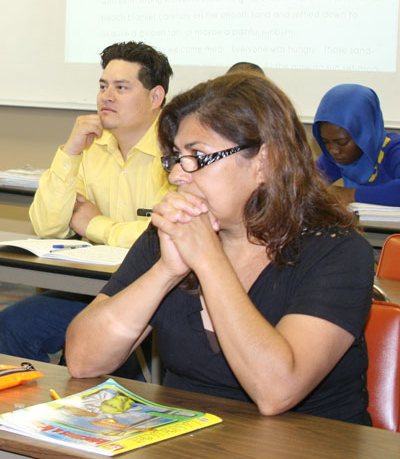 EL/Civics classes provide civics instruction for immigrants and U.S. citizens. Citizenship classes are designed for immigrants working toward becoming U.S. citizens. Instruction is provided to students who are 16 years or older and have either officially withdrawn from a Nebraska school or have completed home-schooling. For more information, contact one of the following local coordinators or CCC Director Ann Chambers at 308-398-7446, toll-free in Nebraska at 1-877-222-0780, ext. 7446, or by email at achambers@cccneb.edu. ESL -- Classes meet at the Columbus Family Resource Center, 3020 18th St., Ste. 4. Orientation is held on the first Monday of the month at 9:30 a.m. or 5:30 p.m. Students are required to attend an orientation session and pre-testing before they can take ESL classes. Orientation dates and more information about the ESL classes can be obtained by calling the Mary Wiegand. ESL beginning, intermediate and reading and writing classes are offered. The citizenship class schedule varies; please contact Mary Wiegand for more information. ESL classes meet from 9 a.m. to noon and from 6 to 9 p.m. Mondays through Thursdays at College Park, 3180 W. Highway 34. The citizenship class schedule varies; please contact Jessica Igo for more information. ESL classes meet from 8:30 to 11:30 a.m. and from 6 to 9 p.m. Tuesdays and Thursdays at Head Start, 123 N. Marian Rd. The citizenship class schedule varies; please contact Anne Cannon for more information. ESL classes are offered from 6 to 7:30 p.m. Mondays, Tuesdays and Thursdays and from 9 to 11 a.m. on Tuesdays and Thursdays at CCC-Kearney, 1215 30th Ave.
ESL classes meet from 9 a.m. to noon Mondays through Thursdays and from 6:30 to 8:30 p.m. Mondays, Tuesdays and Wednesdays at CCC-Lexington, 1501 Plum Creek Parkway. The citizenship class schedule varies; please contact Marilynn Hersh for more information. Students are required to attend a registration/orientation session prior to attending classes. ESL classes meet from 4 to 7 p.m. Mondays and Wednesdays at the Schuyler Public Library, 1123 A St.
ESL classes are available Mondays through Thursdays at Cargill Meat Solutions, 590 Road 9. Beginning classes are held from 10 to noon and from 3 to 5 p.m. on Mondays and Wednesdays. Intermediate classes are held from 10 to noon and from 3 to 5 p.m. on Tuesdays and Thursdays. ESL classes meet from 5 to 7:30 p.m. Wednesdays at St. Edward Public Schools, 601 Clark St., but please use the door on 7th St.